Indoor kids, rejoice! 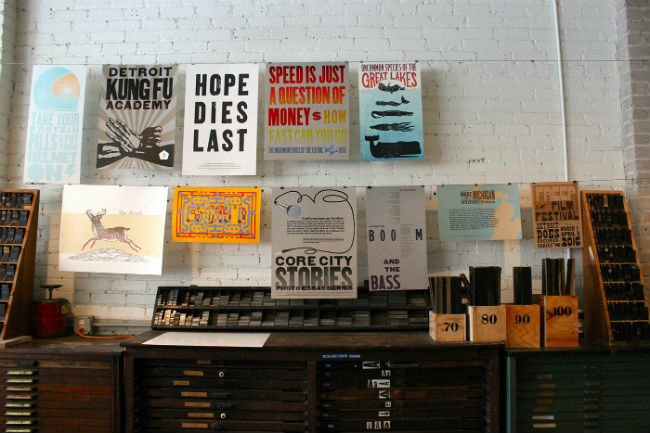 Community letterpress studio Signal-Return breaks up the dog days of August with a series of youth workshops designed to introduce participants aged 7-17 to the underlying concepts of relief printing. While some kids want fun in the sun or endless visits to the pool, the seven budding artists hard at work on their own creations seemed equally as enthusiastic about rolling up their sleeves and creating their own original prints when I dropped in on the first workshop of the month. I witnessed personalized “thank-you” and “Happy Birthday” cards in progress, two separate sunset designs, and a handful of abstract works. The workshop series is overseen by Dahr, who spent 15 years as an English teacher and embraces the opportunity to work with young people again in a less structured context. Dahr, who identifies writing as her primary form of creative expression—her debut novel, Bijou Roy, deals with issues of contemporary Indian-American identity and womanhood—discovered her love of letterpress after moving to Detroit from Brooklyn.